It has been the experience of your correspondent, and that of many others in the past, that safety in diving doesn’t sell. Just as car buyers offered the choice between an entertainment system or more airbags will choose the former, divers are just the same. They know bad things will never happen to them so have no inclination to spend on emergency safety gear. One of diving’s great risks is being swept away. As one old hand observed ‘In a current you’re like a leaf in the sea’. And if it’s a bad day and seas are up and the current’s running things rapidly get very hairy. Recently four of us went out on a less than perfect day to dive a wreck about half a mile offshore in 51 metres. Breeze was 15 knots gusting 18 and blowing from the shore, current about one knot heading south. The other three were all breather divers and planning to spend 30-40 minutes on the bottom with a run-time of roughly 1hr 40 min total. I was going to dive open circuit for a lesser bottom time but, looking at the wind, sea state and current, opted to boat for the others. Two had scooters. One, let’s call him Jeff, scootered away from the wreck after a short time on the bottom, and realising he was lost did a blue-water bag-ascent. His irresponsible mates carried on their original plan, disregarding the disappearance of their erstwhile buddy. The wind speed picked up to 25 knots, gusting 30 plus with the sea state deteriorating. Jeff surfaces way down current after a bag deco, his safety sausage blows flat in the breeze and his scooter is only powerful enough to hold station in the current, not to make headway back towards the boat and I’m not keeping a sharp lookout this early in the dive plan. He’s smart enough to know he’s in trouble and cool enough to look for assistance. By now the deteriorating conditions send recreational fishos in their runabouts back to shelter. Two pass by in Jeff’s vicinity but are oblivious to his efforts to attract them. The third almost runs him over before he sees Jeff and stops to take him on board. Meanwhile I know nothing. I see from my chartplotter the other two miscreants have pulled the anchor so I lay out a sea-anchor to stop a drift to New Zealand while these guys do their hour long deco. First one back on board has the temerity to ask ‘Where’s Jeff?’ I think his ears are still ringing from the abuse I heaped on him for not aborting the dive when one of the party disappeared. Then the search was on. Sixty minutes of pounding through heavy seas, working out how far a diver would have drifted in an hour and a half, searching likely drift patterns and half expecting to find a body. I had alerted Marine Rescue earlier, first of all with a heads-up when the divers were down and the weather was going bad and then again when the search started. Our stress ended on getting a VHF call from Rescue to say our missing diver was on the boat-ramp jetty back in Botany Bay. He alighted from his rescuer’s boat just as the Marine search vessel was preparing to leave the same jetty to look for him. All three of these characters, having learned a first-hand lesson of how bad things can get when conditions turn nasty, went out the same day and bought a Nautilus Lifeline submersible GPS/VHF radios, with two others of my regular diving mates following their example. Nothing like a bit of sphincter puckering to bring reality home and to encourage investing in a life saving device. 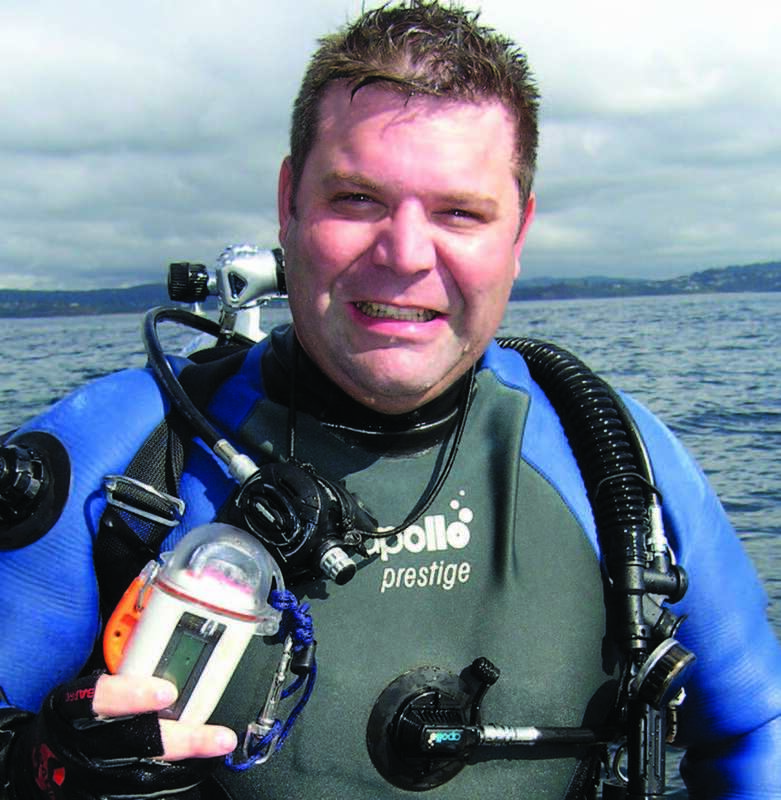 From Dive New Zealand & Dive Pacific A/M 2012 Issue #129. I spend a large amount of time playing on jet skis in heavy surf but still require a radio for launch, beach, and emergency. I enjoy rough heavy seas and normally break about five or six radios a year. I was mailed a brochure of the LifeLine from Killerdeals in SA. I had a look at the radio and believed that it was the only radio viable for my use, and that has proved correct. In SA most of the ski boat launch sites require a 29 MHz but that is slowly changing as the 29 MHz hand held units currently available are absolutely useless for our application. All jet ski skippers, whether they fish or play, are having issues with the 29 and as a result the clubs are starting to allow VHF as well. I believe that there is a good market for a strong waterproof VHF – I attach it to my vest, if I am thrown from the ski and the ski is washed onto rocks at least I have a radio in hand. It's a great product - so far no problems at all. If you consider the price it's very cheap compared to five radios a year that break up on landing big jumps. The radio being attached to my vest is isolated from the impact and vibration of the ski which works well.